Darren Aronofsky is a terrific director and one of this generation’s best. He excels at making actors the very best they can be, diving right into the minds of mentally unsound characters, and captivating perspectives of the world that are difficult to find. However, he works best when he is sitting down with these characters and these environments face to face. The last film he directed that was meant to be an epic was The Fountain; A gorgeous yet misguided film that tried to do too much with so little. With his second attempt at making an epic, he not only chose a story familiar to most (that of Noah and his ark) but he mirrored his failure with The Fountain through Noah himself: A man who did as much as he could with what little he had, even if it meant sacrificing himself. 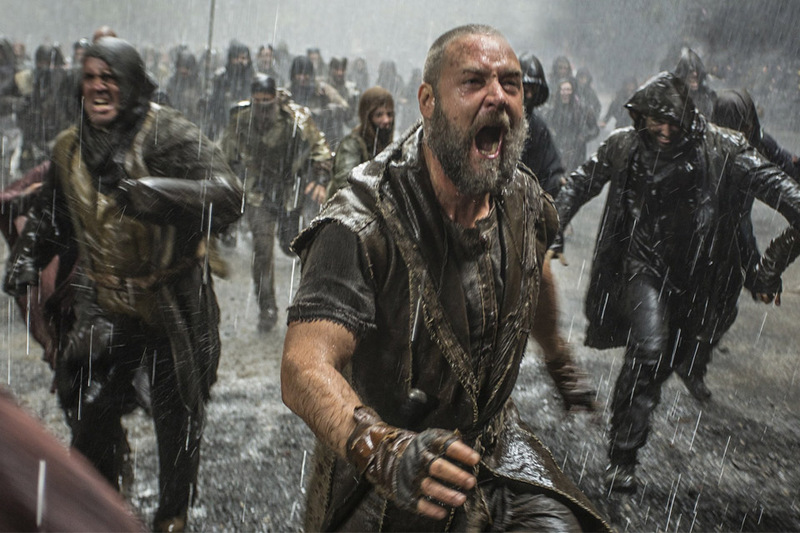 Noah is interesting because it isn’t as phoned in or preachy as many Bible films can feel. It is peculiar because it feels like two things one would not expect it to resemble: A fantasy epic ala Lord of the Rings, and one large compilation of cut scenes from a creator video game ala Lionhead Studio’s Black and White. Parts at the beginning of the film felt a little bit like the battles featuring the Ents in Peter Jackson’s film trilogy, and many of the resolutions for each scene felt as though I was about to start clicking around to start this new mission. Either way, Noah was fairly engrossing most of the time. The most exhilarating moments are those where the actors on screen throw everything they have at us, and this film has a stellar cast. In fact, this cast has a bit of a theme attached to it: Actors wanting to make a new name for themselves. We also have a bit of a game of six degrees of separation here: Russell Crowe and Jennifer Connelly have acted in A Beautiful Mind and Winter’s Tale, Emma Watson and Logan Lerman have acted in The Perks of Being a Wallflower, Ray Winstone and Anthony Hopkins were in Beowolf, and so forth. Referring back to the names that these actors, ever so committed to one another through the chemistries brought back from previous works, wished to claim, we have two categories: The veterans and the newcomers. Crowe and Connelly have worked on some pretty underwhelming films lately, and it took a film like Noah to remind us about how truly great they are. Connelly has been misused and shoddily directed, especially as a throwaway supporting actor, for quite some time and it is so refreshing to see her take command of the screen as a lead role; Even as possibly the best actor in the film. Crowe has redeemed himself as a bold and stable lead, and he effectively turns Noah into both a strong hero and a simple man who may possibly have gone too far mentally. Even Noah, the man chosen by the Creator for the job, isn’t perfect. The newcomers wanting to have a new reputation through Noah are both Lerman and Watson, who wish to separate from their past films, whether they be good or bad, and be considered good actors on their own merits. They both succeed greatly with their best performances yet, where not a Hermione Granger or a Percy Jackson were in sight. Both Hopkins and Winstone are as consistent as they always are, so nothing but greatness was expected (and delivered) from them. The cinematography is the film’s other greatest strength with many stunning shots that will cling onto you at every second, even when the story may not. The numerous landscape shots are exquisite, the arrangement of the menagerie of animals is well choreographed, and every single shot is stuffed with enough space or enough detail to make ever corner of the screen fascinating. Everything from the gritty look of the people, the design of the ark itself, and even the small changes in the animals from as we know them to something we haven’t quite seen before, has signs of extreme care shown. This is the take on Noah’s story that Arrenofsky has dreamed of for years, and every little bit of it was brought to life here in the year’s most visually delightful film so far. The philosophies in the film are admirable, as Arronofsky combines religious texts with science, fantasy, and even psychology. It is implied that all was created by one being (the Creator), yet evolution still took place. The fallen angels are represented as stone giants, partially referencing the story of humans being made by clay in Greek Mythology,and are clearly artistic designs of what Arronofsky got from the source material. The film isn’t preachy, which is a big sigh of relief, and it even implies that Noah may have been a bit mentally unsound. Why shouldn’t he be? He’s got this huge task to save the animals and his family and he is only told of his mission through abstract dream sequences that can easily be misunderstood. WIth Noah teetering on the lines of being both a hero and a possible threat to the other characters, we are given a much more multi dimensional film than can be expected. Arronofsky excels triumphantly at the end of the film where, in true Arronofsky fashion, a few intense situations happen at once and all of these characters collide mentally with one another. There are a few setbacks that are fairly minor but are definitely noticeable. The title cards are fairly amateurish, which is a disappointment considering how beautiful the movie is (it’s a petty flaw but it is one that can’t be brushed off either). To start a film out with these gaudy title cards makes it a bit harder to get into the film right away, but the film carries on and we quickly forgive it. However, the odd event plot wise can be quite contradictory. Noah talks about being good and not killing as it isn’t what the Creator planned for us, yet he kills in the name of his own defense. If it is to show that even Noah is flawed, shouldn’t he let himself drown for being sinful? He acknowledges that he and his family are full of sin as well, and he spares a few lives out of love, yet he let his son Ham’s love get trampled to death? He does apologize for not saving that girl, and it is a bit of a save that he reflects on himself being a man who cannot sort out what he should do without further guidance, but it is still a bit of a bother that makes us side with Ham and his grief. Nonetheless, with the odd flaw here and there, Noah is still quite a ride. It may not be Arronofsky’s best film, but it is still so much more of a film than can be expected of it. It manages to sort out what kind of a story it wishes to tell, it delivers that story fairly easily, and it even leaves us with some last impressions. If Noah is a film to be watched, it is for its acting, its visuals and the odd tremendous scene that will leave an impact on you. As for the story itself, it is a good effort and a risky move that may sit well better for some than for others (it sat well with this watcher here). Its way of telling the tale may not be of everyone’s taste, but its human emotions and its celebration of the world are enough to ring a universal passion with each and every audience.